Not just a seafood house, The Daily Catch also captures a taste of Italy with Sicilian-style dishes. : Italian-American bonhomie meets Sicilian-style seafood at this local favorite that offers some of the best fried calamari in town: crispy and ocean-sweet, nipped with lemon and dabbed with olive oil (with red sauce upon request). Besides basic linguine and clams, this waterfront spot specializes in dishes like monkfish Marsala and lobster fra diavolo. Simply grilled or broiled seafood, including tuna, wild salmon, swordfish and haddock, are also available. 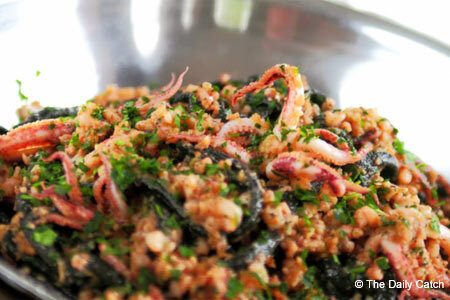 Don’t miss the black pasta with tinta di calamari. Round out the experience with a sampling of tiramisu, cannoli, gelato or the day’s Italian pastry. Also located at 323 Hanover St., Boston, 617-523-8567; and 441 Harvard St., Brookline, 617-734-2700.